The HealthTrainer 601 treadmill is another decent entry level treadmill from Keys Fitness. (Keys Fitness is the owner and manufacturer of the HealthTrainer as well as other treadmill brands) Its specs and features are similar to other entry level models from other Keys brands. This machine would fit individuals who are a little tight on the budget. This is just a basic machine so don’t expect too much from it. If you want a feature rich treadmill that would really give you challenging workouts, visit our best buy treadmills page and choose a treadmill in the $1,500 or above price range. This HealthTrainer treadmill offers a 2.0HP continuous duty motor with max speeds of 10mph and max incline of 12%. But for the price they’re asking, they should have made this model more powerful. The 18inch x 51inch tread belt also needs improvement if they want to compete with quality treadmills in the price range it’s in. Well… at least the small motor won’t have to work as much (which extends its life) since the tread belt is also small. And finally, just like most treadmills manufactured by Keys, the HealthTrainer 601 treadmill comes with 10 years motor warranty. That’s hard to beat especially in its price range. Other warranties include… lifetime for frames, 2 years for parts and a year for labor. Other than the long motor warranty, everything else is a weakness. However, Keys Fitness is just a new comer in the industry and I believe we should give them more time to improve their treadmills. I don’t recommend the HealthTrainer 601 treadmill. If you really want a treadmill from Keys Fitness, you’ll get more value from buying an Alliance unit. 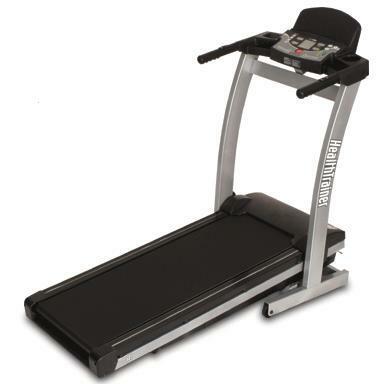 If you plan on buying a HealthTrainer 601 treadmill , I suggest you locate a dealer through keysfitness.com. It is currently being sold for $1,099.